The rise of coffee’s popularity has continued to grow with every generation since its discovery in the ninth century. Legend has it that an Ethiopian goat herder named Kaldi first discovered the magic beans when he noticed changes in his animals when they would eat the Coffea plant beans. Today, international coffee shops and the prevalence of coffee books is inspiring many coffee lovers to learn more about their favorite beverage. Here is an excellent place to start a journey of discovery into the vast culture of coffee. Berman presents an easily understood introduction to the many detailed facets of the coffee industry. Topics include a little bit of everything from the explanation of different roasting styles to a glossary of popular coffee concoctions. This book will help readers develop a foundation of understanding in the history, manufacturing and etiquette related to coffees around the world. The small pocket-journal style of the book makes it a reasonable companion for coffee outings. It always seems that learning a little leads to a desire to learn more. With regard to coffee, an introductory taste of knowledge will inevitably result in the desire to be more proactive in the preparation of one’s favorite beverage. Here, Sanders and Sandbeck offer answers to the burning question: What do I do if I want to roast my own coffee beans at home? This is a very simple introductory book. This is not a book full of comprehensive color photos or tireless detailed explanations; it is a direct and concise guide to help one understand the basics. From here, the world of home roasting will seem more accessible. This is a book for those who are a little more interested in the true story of this commodity. As with all cash crops, coffee has inspired struggle and strife around the world as people attempt to profit from the universally enjoyed beverage. 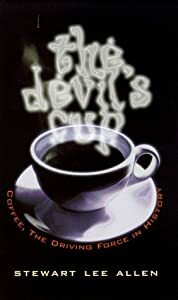 Allen gives a witty and striking look at the modern industry of coffee trade that reveals some comical, shocking and puzzling facts about the beverage so many enjoy on a daily basis. Readers that enjoy this type of revealing non-fiction will also enjoy Coffee Talk: The Stimulating Story of the World’s Most Popular Brew by Morton Satin. These are just a few examples of a very wide range of coffee books that are on the market. Whether you are looking for something more informational on the history of coffee or a beautiful presented coffee table book on coffee, full of lovely glossy pictures of your favorite brew, if none of the above appeal then browse through the full collection of books for coffee lovers.